How many times you find yourself creating records from scratch locally so you can get to a point in your program where you can actually debug what is going on? If the whole team shares some sample data in a populateDB.sql script it could be run at any time by any developer. The main problem we face is with foreign keys that we need to use but we don't know their ids. Below is an unobtrusive MySQL script that creates a new employee referencing an existing office and a newly created department. Hopefully this is enough to get any data populated thanks to @variables and the last_insert_id() function. Regardless which security options you are using LDAP is the place to store user groups and credentials. I am not going to explain why, as the Web is plenty of explanations but I will show here how to get ApacheDS working so you can start using LDAP for authentication purposes. If you are doing Web Programming in Java I recommend Spring Security. I am providing an example of such integration. 1. Download and install apacheds(v 1.5.7) and ApacheDirectoryStudio(v 1.5.3). 5. Open ApacheDirectoryStudio and select File|New|LDAP Browser|LDAP Connection. Name it "localhost", hostname=localhost, port=10389, use No Encryption. Hit “Check Network parameter” and be sure the connection to the server is succesful. Use bind user=”uid=admin,ou=system” and bind password=”secret” (defaults). Hit “Check Authentication” and be sure it is succesful. 7. You might have to close the localhost connection and open it again from ApacheDirectoryStudio. Migrating stuff from Active Directory to ApacheDS is a question that we find in forums every so often. As the ldif (ldf extension in MS world) format is a plain text file you can use any tool that do search and replace. Here is where Unix Power Tools come (like so often) to your rescue. My original file came with fields I wanted to delete, others I wanted to rename and even some missing fields. All that can be done with sed (The stream Editor). Here is the command line statement that makes it happen. Please respect the "\new line" as it is responsible for adding the new lines you need. Of course we are creating empty passwords here. JPA 2.0 supports JSR 303 annotations. Annotations then can be used from a taglib to provide in the front end the basic validations already available in the backend. That is perhaps the subject for another post. 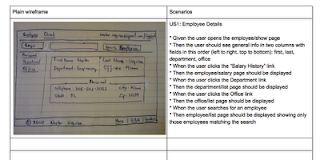 It all started with diagrams that were filled out very soon with lot of wording, then just plain English Use Cases and finally a combination of wireframe diagrams and user stories. Now we can deliver while hapilly checking things off the list in a daily basis. It was all written years ago but still so many of us were trying to go around the inevitable, you must INVEST in good user stories. No need to find culprits, let’s get agile right from the beginning: The “specs”. Don’t get too extreme though. Nobody said you cannot extend the written portion a little bit so a whole use case makes sense when joining the different scenarios. 1. Do it your way: XP, Scrum or a combination but make sure stake holders know what you will be delivering. Make them participate on the creation of scenarios (User stories) and wireframes. Try (why not?) making them comfortable with the tools (simple tools, keep on reading) you use. You might be surprised finding out that some of them can even provide a whole specification that is actually testable and implementable! If you have a Business Analyst (BA) then you are in luck, without any doubts s(he) will need to become your “story teller” (quoting here the guy behind http://masterstoryteller.co.uk) and your "Mock up drawer". 2. Keep it as short as possible and do the job incremental but without losing the most important features so the software can be used right from first release in production. 3. Make sure the developers agree the scenarios are feasible and commit to get it done in a reasonable amount of time. Without the right crew there is no possible agility. 1. Use a rich editor where you can put images on the left and text on the right. Google Documents is perfect for sharing, versioning, and ... well it is Google you know. I just use a two columns table. Google allows to insert the picture from local File System, from URL or web search. 2. Draw a flat wireframe using paper and pencil. Yes just use an eraser for corrections ;-) I commonly use copies of a master template which contains things that are fixed for most of the site like the basic footer, content and header layout. 3. Take a picture of it and put it in the left column. I commonly use an Android phone and upload the picture directly to Picasa. From Google Documents you can import its URL as I said. And yes you can resize to meet half of your landscape page or to get more details about it as Google will save the whole raster image and not just the resized result. 4. Write your user story. Yes, try to make it short but not shorter than needed! (Modified Einstein words here ;-) The most important part is that what you write you can test. In a User story (if well written) you can get the needed information for a developer to provide behavioral/functional/integration tests and at the same time for you as a BA to confirm the delivered product meets the business requirements. Below is a screen shot taken from Google Docs. You are filling out a web form and suddenly you face a problem: You cannot find the option you need from the provided list. You soon realize you can add a new value there pretty easy and you jump into a new UI screen. You save your new value and ... you get lost when you realize your initial form has to be filled out again. Simply put: state is gone. 1. Use JQuery to build a returnUrl that includes the current state of the form and provide it as a parameter when you navigate out of the current form. Here is an example that does that assuming you assign to your "Add" anchor a class named "addAndReturn"
//getting rid of the submission flag, in this case hidden field "submitted"
I argue all the time about allowing GET in forms. Let us not get into that argument but rather discuss the alternative when using POST. net.sf.json.JSONException: There is a cycle in the hierarchy! The solution for the above issue is to mark as transient the offending field. The problem is you do not want to mark it as transient for just everything. Use then annotations. When changes are made to an existing project very often database metadata needs to be changed as well. Metadata migration scripts are useful SQL bits that are run to ensure a new version of the program will work as expected. Data migration scripts are needed to prepopulate new or existing tables with predefined values. Rollback scripts are SQL bits to be run in case the whole deployment goes wrong. They commonly affect metadata in a reverse way when compared to Migration scripts. If database changes are actually backward compatible (they do not break previous deployed program functionality) then there is no need for sql bits inside the rollback script, but still there is a rollback script which happens to do nothing. The whole purpose of this post is to document what should be done but it is also a starting point to provide some kind of automation in the future. At the time of this writting Reverse and forward database engineering in MySQL can be done using MySQL Workbench however you need to purchase the standard edition of the program (Features are disabled or not present at all in the Community edition). Still mysqldump comes to your rescue and as it is a command prompt tool the chances for automation are big. 1. Create the tables from Java. You will probably need to uncomment the below code from test persistence.xml and run Unit tests. In a real world scenario you will need to comment and uncomment several files as you might be using for example an in memory database like HSQL for your JUnit tests. After tables are created you should uncoment the code to avoid undesired data wipe out during your tests. 5. Download the latest released metadata. Your local file will be something like r8509.myDB.sql. 9. Create migrations_data.sql containing all new data you want to push into the database. Again even if there is nothing to be included make sure you have the file with empty content. Additionally be sure you create data.sql which is the equivalent of $DB but just to populate data. 10. Locally test that creating the DB by hand using previous released $DB and later applying migration_metadata.sql plus migration_data.sql everything goes fine. 11. Include the migration*.sql, data.sql, $DB.sql and rollback.sql in your resources/db folder so they get tagged with the next release. If no need for rollback.sql / migration_data.sql still create / update with blank content. 12. Optional: You can use MySQL Workbench to graphically compare the metadata from previous and current relelase or in fact between any releases. This helps to check tables, fields and relationships are generated as expected. 13. Open MySQL Workbench 5.2.26 or above and select “Model | Create a diagram out from Catalog Objects”. Organize your tables and print to pdf using the naming convention $RELEASE.$DB_VERSION.pdf. Publish them on a WIKI location so the whole team can see the underlying model. 15. Deploy the application in Staging: Run migration*.sql scripts. Test. 16. As above for production. Note that in order to get email notifications for pages you watch you must authorize your email and check the box "E-mail me when a page on my watchlist is changed". Just look for "E-mail confirmation" in your Preferences page. Releasing and deploying a Java Web application (WAR application) involves several steps. I have been using Maven and Subversion for this task with very good results. IMO it is *not* good to release from your local machine if you are part of a team. I have released from my local machine from time to time but I have found way safer to do it always from the same server where other developers can login and follow exactly the same steps. 1. Modify the project pom.xml to specify the version number. It must end with the string “-SNAPSHOT”. 2. Modify the project pom.xml to specify where to tag the code (svn tags folder). 4. Just in case you use Windows or Mac from the machine you will be releasing do yourself a favor and add the below to you pom.xml. This way the build will be using 'UTF-8' encoding to copy filtered resources. 9. Prepare the release. Default options should be OK as they ensure the pom.xml gets updated to next version number. Of course when there is a business decision to change the minor or major version numbers then you simply edit the pom.xml and commit the code to SVN before attempting to run release:prepare. Pay attention to dependencies, maven will complain if you try to use snapshots but if you decide so it will allow you to point to them. So be sure you update your own jar dependencies if any forcing the project to use a release version. When you are done the project should be tagged, thing that you can confirm navigating to the tagBase url. 10. Perform the release. This will download the project from the tag, build it and commit the final release to the artifactory repo. While posting also to the cargo-user mailing list (Starting from the above link you can see the history) I have come to the conclussion that environments can get really different: clustering, sticky session configurations for load balancing, symlinks to apply DRY and so on. I think still bash (perl, python or any other or your preference ;-) offers the flexibility to use maven power in literally any environment. echo "Usage - $0 warFileUrl"
echo " Where warFileUrl is the WAR archive URL"
While this is something that can be done from a Continuum integration server you might find Business analysts trying to deploy different branches of your project from time to time. It is then a good idea to offer the possibility to actually deploy from an SVN URL. In that case the script above will need to be modified to allow a parameter with the svn project URL (using type=warSvn or explodedSvn for example). The script should then checkout from the repository, build locally and deploy to the server. That is exactly what I have done in a modified version of the script that I will be maintaining at my google repo. 2. Deploy a WAR file build from SVN. As the repository might be organized in different ways an extra parameter “projectName” must be provided. 3. Deploy a JAR file from SVN. In case you are wondering why will you need this the answer is to be able to deploy snapshots that depend on snapshots in case you are not publishing them into a maven repo. To be honest you are better off trusting snapshots, you better build them yourself at deployment time. I spent a considerable amount of time today trying to get Spring Security with LDAP (Active Directory) working. The error below was showing up even though the Active Directory server was correctly authenticating the user. But I was member of several groups! I added group-search-base with same content as user-search-base (same root) to ldap-authentication-provider and then I got authenticated and got my roles (Spring authorities or in this case Active Directory groups) back from the server. In the case you need to reinstall MySQL because the above does not work you need to run some commands in order to be able to reinstall. Finally I recommend using version 5.1 instead of 5.5. It works more stable in OSX in my experience.